The Cerritos Center for the Performing Arts (CCPA) offers spacious and elegant facilities ideal for corporate presentations, meetings, awards, and banquets. With four distinctive spaces, the CCPA can accommodate any event from a small board meeting for 16 people to a large industrial sales launch for up to 1,700. Let us assist you in planning your next corporate event. Our commitment to excellent service and our professional staff, combined with a convenient location and versatile meeting-room space, ensure that your event will be a success. 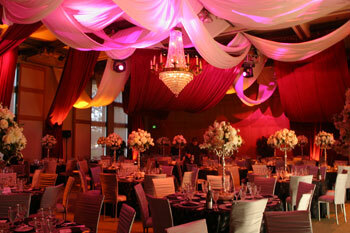 When you need to create a lasting impression, the CCPA sets the stage for a memorable event. Winner of countless awards for its unique architecture, the CCPA's theater can be transformed to fit the needs of groups from 300 to 1,700. The CCPA sets a new standard in business elegance by offering a rich and sophisticated ambience. The Sierra Room is an ideal choice for events that range from 25 to 400 guests. Sound-isolated room dividers allow us to customize the size of the room to accommodate your event. We offer first-class service and professional technical staff for your audio-visual, lighting, and staging needs. An elegant red granite table is the centerpiece for this intimate room, which offers comfortable and spacious seating for board meetings or executive luncheons for 16. This open-atrium setting is complemented by a sweeping spiral staircase, elegant designer fireplace, and copper and granite accents that add to its rich ambience. A luxurious full-service bar, fountain view, and direct parking-lot access make this space ideal for cocktail parties and banquet receptions. For additional information or to schedule a tour, please contact the Special Events Office at 562-916-8510, ext. 2827.